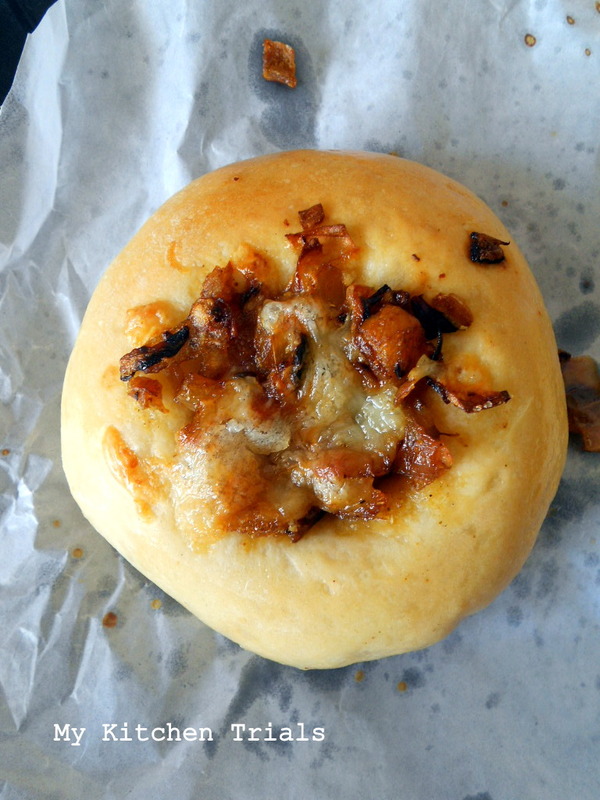 The month of May has come and gone and my Bialys bake for the We Knead to Bake group is coming up a bit late. I know I am stretching that ‘bit late’ part a lot here, but things were just happening and it was difficult for me to come here and do this post. Or any other post. In fact, past month have been more of ‘I need a break’ than ‘We Knead to Bake’! I baked these couple of weeks back for breakfast. I was on my way out and I took some hasty shots while the bialys were still cooling in the tray. It was a good thing that I clicked it, because by the time I was back, there was one happy hubby and none of the bialys (or ‘beeyalees’ as they are pronounced!). So I am guessing they turned out fine :-). I am also joining you in enjoying the virtual treat here, because that’s all I got too this time! Dissolve yeast and sugar in warm water and set aside for 10 minutes. If the yeast doesn’t foam up, you need to start again with a fresh batch. The dough will not rise if the yeast doesn’t bubble up. In a food processor, add the flour, salt and vital wheat gluten (if using). Pulse couple of times for it to mix. Add the yeast water mix to this and pulse until you get a dough ball. You may have to add some more water as required. Add it in small amounts else you may end up with a sticky dough. Let the dough rest for 10 minutes and pulse again until you get a smooth and elastic dough. 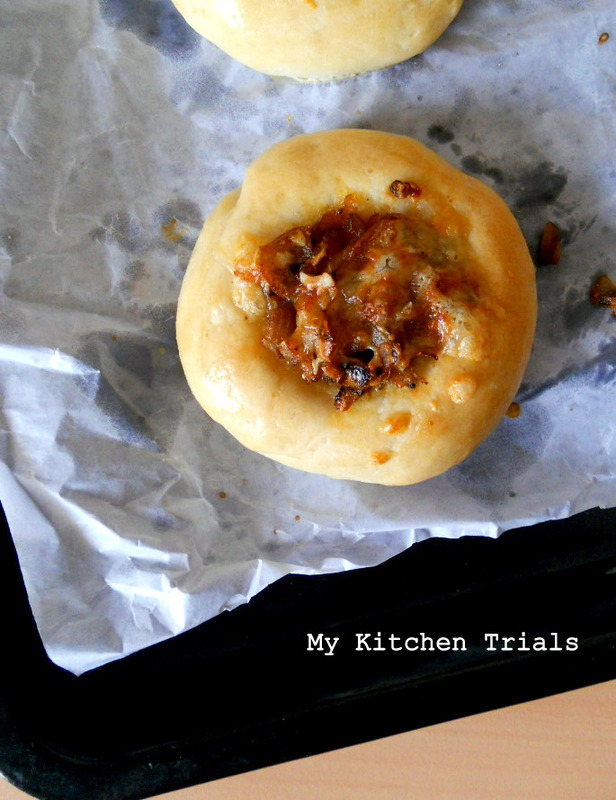 Shape the dough into a ball, I kneaded it a couple of times. Let it rest in a well oiled bowl. Turn the dough around so that it is coated well with oil. Cover with a clean, wet kitchen towel or cover the bowl with a lid and set aside for two hours or until the dough has doubled. The dough can be refrigerated overnight at this point of time. For the filling, chop the onions finely. Heat a tablespoon of oil. Add a teaspoon of cumin seeds(optional). Add the onions and sauté until it becomes golden brown. Add salt, chilli powder and garam masala. Take off the heat and let it cool. For bialys, divide the dough into 8 equal parts. In a floured surface, flatten each ball into a thick circle. Pinch the ends together to get a smooth ball. Place these in a greased baking tray and let it rise for an hour. Take one piece at a time and shape them so that the sides are raised and you have a depression in the middle for the filling to go. 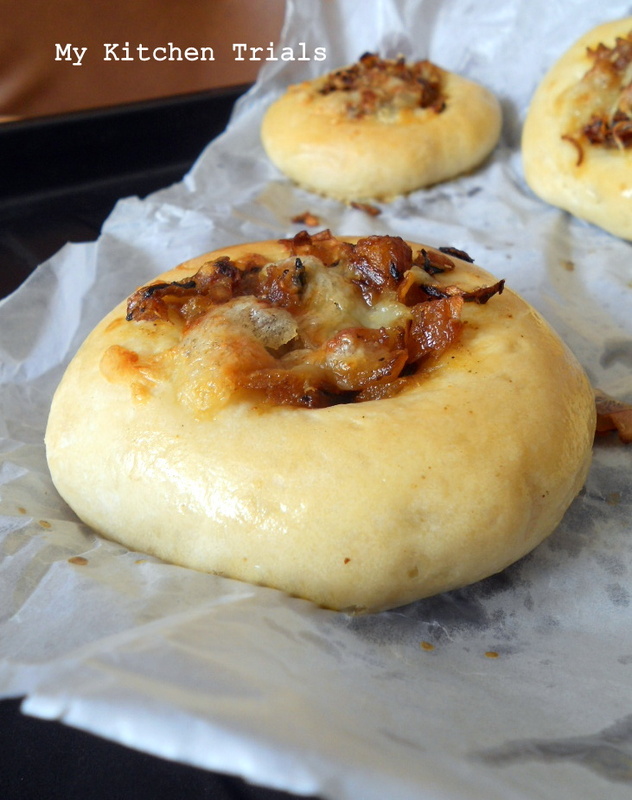 The centre should be about 3″ and the puffed up sides about 1″, so totally the bialy will be about 4-5″ in diameter (mine were much smaller :D). Using a fork, pinch the centre so that it doesn’t raise while baking. Shape all the dough balls and brush them with milk or butter. Line them in a tray leaving some space between for the bread to rise. Bake in a preheated oven at 230 C for about 15 minutes (adding the filling (Sautéed onions) to the centre at around 10 minutes with the cheese on top). Take off the oven when they are golden brown and brush them with butter. Cool slightly and serve! Beautifully done, who will say no to this fabulous bialys. I so wish I could pick a few of those and munch on. i read in ny magazine recently that these are endangered. it’s hard to find them in nyc. yours look great!